Under special provisions in Section 329 of the INA, the president signed an executive order on July 3, 2002, authorizing all noncitizens who have served honorably in the U.S. armed forces on or after Sept. 11, 2001, to immediately file for citizenship. This order also covers veterans of certain designated past wars and conflicts. The authorization will remain in effect until a date designated by a future presidential executive order. USCIS and the Army established the Naturalization at Basic Training Initiative in August 2009 to give noncitizen enlistees the opportunity to naturalize when they graduate from basic training. (The Navy joined the initiative in 2010.) 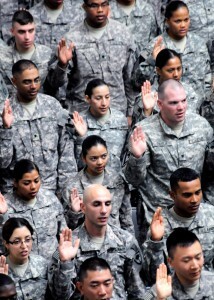 Under this initiative, USCIS conducts all naturalization processing including the capture of biometrics, the naturalization interview, and administration of the Oath of Allegiance on the military base so (in most cases) the recruit is able to graduate from basic training as a U.S. citizen. Sending an e-mail to the military customer service specialist at: militaryinfo.nsc@dhs.gov. Section 329A of the INA provides for grants of posthumous citizenship to certain members of the U.S. armed forces. A member of the U.S. armed forces who served honorably during a designated period of hostility and died as a result of injury or disease incurred in or aggravated by that service (including death in combat) may be eligible to receive posthumous citizenship, as long as the next-of-kin applies for posthumous citizenship within two years of the service member’s death. Other provisions of the law extend immigration benefits to the service member’s surviving spouses, children and parents.